Well it would seem the the chief farmer never got that memo! 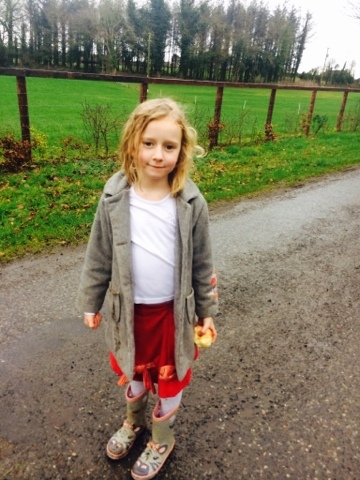 Coats, hats and wellies on, the glamour of ‘Sunday best’ is well and truly behind us, and off we go. I would be the first to admit that himself and myself don’t work great together, he has a short fuse, I have a long memory…it doesn’t make for a harmonious team. Something is grunted under his breath but I’m choosing to ignore it. 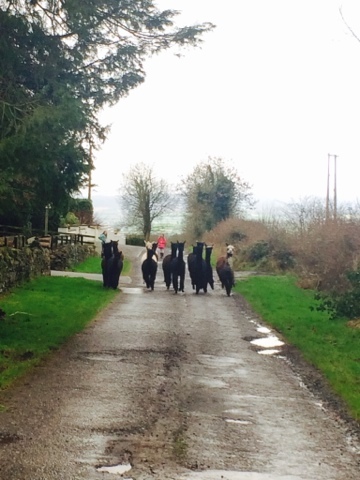 ‘We just need to take the last two weanlings away from their mums’ he says, ‘won’t take a minute’. 25 minutes and two weanlings who look like they are trying out for the national gymnastics team later, we have them separated, they are furious at the separation and show their fury in tantrums that any self respecting two year old would be proud of, complete with throwing themselves down in the yard and point blank refusing to move until even they got bored with the performance, and finally go join their slightly bigger half siblings in the weanlings field. We moved the two mothers across the road into a fresh paddock. 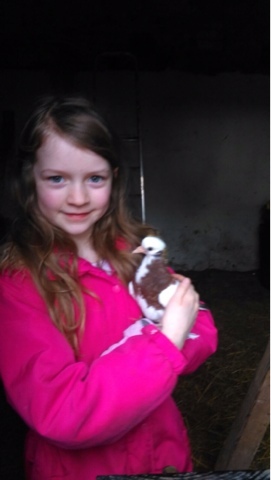 A quick scan revealed that one of our ‘helpers’ was missing, she was located in the dove house where she has undertaken training a dove who had been poorly and is now her new favourite pet, seriously, it’s like she isn’t even related to me! Clearly I didn’t pass on my fear of birds! 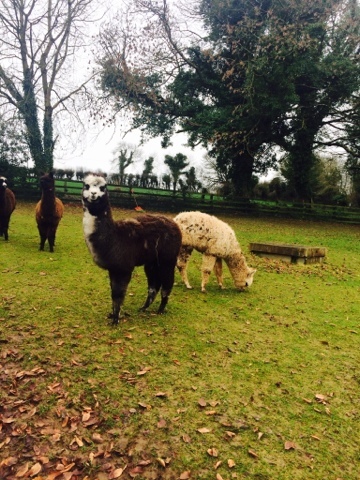 Next up is Shadow, our blind alpaca, moving her is always tricky as you can’t herd her as she can’t see and it’s difficult to corner her as if she bolts she could hurt herself, so the best course of action is to sneak as close as you can to her and as she comes near to grab her and then lead her. This requires patience, often in short supply and relative calm. It was going well until the Emu, who was on a farm walkabout raced into the field being chased by an overexcited puppy who in turn was being chased by two of the four children, suffice to say the chaos meant that we weren’t getting anywhere near the startled Shadow. The puppy got called some fabulous names, none of which were her actual name, nor are they repeatable! 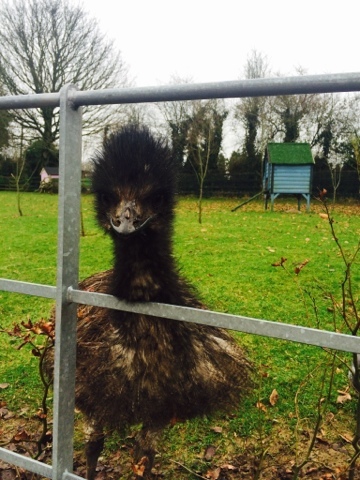 Why did the Emu cross the road? Because she was being chased by the puppy! While this is unfolding we hear a panicked call from the 6 year old to ‘come quick’ as one of the young stud males has jumped the fence and is trying it on with the newly separated female. FFS I mutter, quite audibly! We race across and thankfully, because he is new to the job we manage to intervene and avert a miss-timed cover, coitus interruptus in its most literal sense! We return the over enthusiastic male to his field and decide against putting the females in this close a proximity to the males, but his intended is in such a strop over our actions she point blank refuses to move, no amount of cajoling can convince her and she sits, like a sulky teen for a good 30 minutes giving us every manner of filthy looks. Finally, well over an hour and a half after starting we get the the rest of the girls moved into a new paddock, a safe distance from the boys. Surprisingly there was little shouting, and the under the breath expletives were at a minimum, because with this comedy of errors it’s hard to stay cross!